Home / Home / Want to learn more about the program? 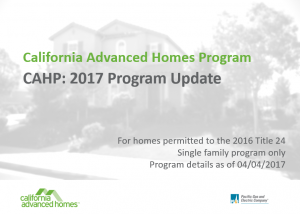 Pacific Gas and Electric Company (PG&E) offers the California Advanced Homes Program (CAHP) to deliver design assistance and incentives for energy efficient new homes. TRC Energy Services administers CAHP on behalf of PG&E. CAHP builders work with Title 24 consultants to model homes in comparison to the 2016 Title 24, which took effect in January 2017. The program evaluates homes based on an energy model output score called the Delta Energy Design Rating (EDR). The entry score is a Delta EDR of 3, as the Delta EDR increases, so do the incentives. 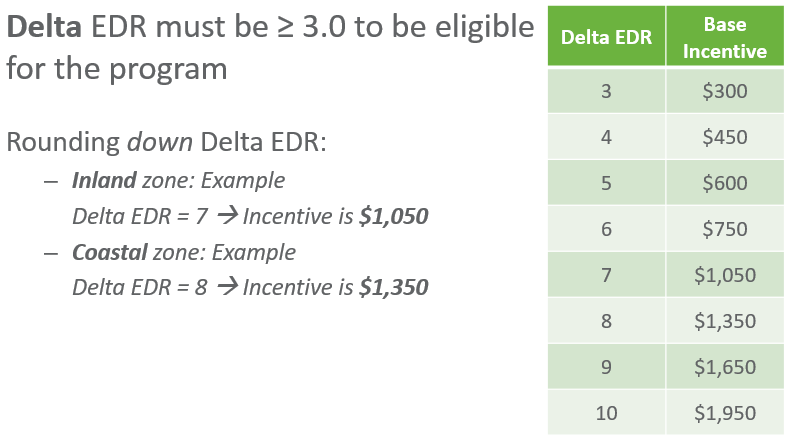 To qualify for incentives homes must achieve the minimum Delta EDR of 3. Participants can increase their EDRs and incentives by improving the energy efficiency of their homes. Refer to the tables below to find your climate zone and approximate incentive. Please use the CAHP Incentive Calculator to estimate the incentive for your home and learn more about incentive kickers. 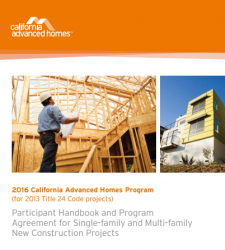 Review the California Advanced Homes Program handbook and orientation to familiarize yourself with the participation process.